Food wastage is an issue that’s been at the forefront recently, and for good reason. In Australia alone, the average household throws away $77 worth of edible food every week! Twenty per cent of food never makes it to the plate, which equates to $1036 per home. One in every five grocery bags goes straight in the bin, businesses waste up to 30 per cent of their produce, and the government estimates that four million tonnes of food ends up as landfill every year – enough to fill 8400 Olympic-sized swimming pools. Those are scary stats! Why? Because not only does food wastage obviously go hand-in-hand with cost (no-one likes throwing away a grand a year, right?! ), but food scraps in landfill emit methane gas, a leading contributor to global warming – so our habits have an enormous environmental effect too. Fortunately, with education comes a shift in motion, and as a national community steps seem to be being made in the right direction. In our little pocket of the world, a homegrown group are forging the way forward by giving the Illawarra the “the tools and forks to tackle food waste and shape a sustainable food future”. They are Hidden Harvest – a not-for-profit organisation made up of passionate and dedicated volunteers, who are extending their #MoreTasteLessWaste attitude to the wider community in exciting and fun ways. Hidden Harvest is the brainchild of Berbel Franse. While working in Ghana, West Africa, on agriculture projects, she noticed there was much potential for food being wasted due to lack of refrigeration or packaging, but despite this, the people there still used every piece of food they received. From cooking chicken bones for nutrients, to cutting-up rotten tomatoes for flavour in stews… absolutely nothing was wasted. When Berbel came back to Australia, she wondered why a similar mentality was not being applied – especially considering the means and resources we have here to farm, transport and keep our food fresh. With a Masters degree in sustainability, Berbel saw the opportunity to implement her expertise and educate those around her, while also encouraging significant and important change at a grassroots level. So, in 2016 Hidden Harvest was born. Made up of a core team of 10, who each have designated roles, and around 30 volunteers, named the ‘Rock Up and Kill It Crew’, who help out at events, Hidden Harvest is making its message known by generating lively discussion and celebrating the ignored, overlooked or surplus products of our food system. Unsurprisingly, festivalgoers were shocked by the amount of completely edible bread that had been deemed garbage. The team used the bread to serve free toast to everyone over the weekend as a statement about what we so easily chuck out. 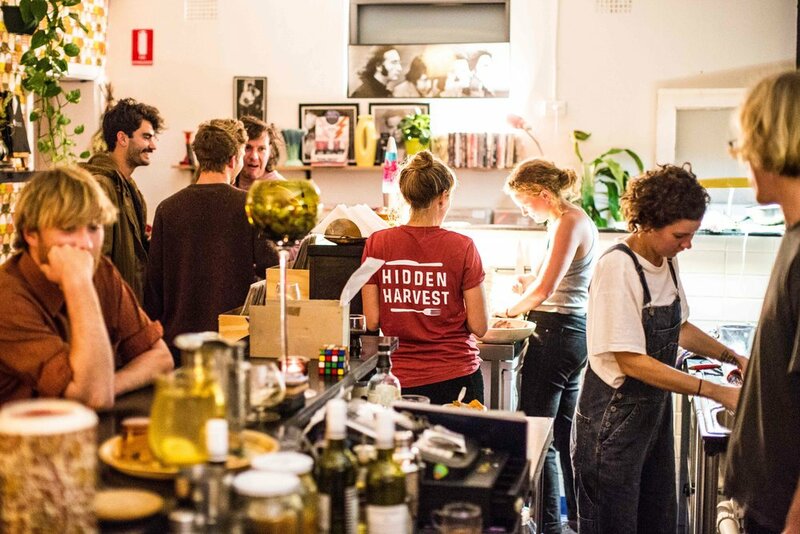 This year the Hidden Harvest team will be back at Yours & Owls over the October long weekend putting a slightly more-spooky spin on their bubbly brand of food wastage fun, with a haunted house and food waste confessional in the works. On top of this, Hidden Harvest sell chutneys across the Illawarra, which a team, known as Pickle Pals, whip up in the Moore Street General kitchen every two weeks using surplus produce donated from local fruit shops. And while such campaigns are making leaps, the food wastage problem often begins further down the supply chain – an estimated 20-40 per cent of fruit and vegies are rejected before they reach the shops. A domino effect of our habits as consumers. Most of us can admit we’re guilty of steering clear of the wonky zucchini, turning our nose at the slightly-brown banana, putting back the imperfect peach – all totally edible but not quite pretty enough. To combat this, start a discussion and try to break habits that are so deeply engrained, Hidden Harvest run workshops at the University of Wollongong. These fun and creative cooking-style classes encourage simple shifts, like using broccoli stalks and beetroot leaves in dishes, and quashing the need to top and tail beans. Small changes that effect big change!